A tractor trailer truck with a damaged saddle tank spilled 75+ gallons of diesel on frontage road of I-35 in Oklahoma City. The diesel was pooled around the truck and pooled in the street. Within the main pooled areas, Oil Solutions Absorbent polymer was liberally applied to contain the spill. Once the saddle tank was plugged and the truck was towed off, Boomer Environmental brushed the Oil Solutions Absorbent into the spill areas and applied a total of 80 pounds of product. After allowing the Oil Solutions Absorbent to absorb the diesel, the contractor swept up the residue and placed it into drums. The Oil Solutions Absorbent absorbed the entire pooled spill, but some diesel had soaked into the asphalt leaving a strong diesel odor and a slight residue. Boomer Environmental requested OIL SOLUTIONS to assist with the application of the OIL SOLUTIONS™ Step 1/Step 2 additives to clean up the remaining residue and the diesel soaked asphalt. Two quarts diesel fuel spilled on edge of a pond. The spill was contained by booms. Oil Solutions Absorbent was distributed over the fuel spill and allowed time to microencapsulate. The resulting mat was folded and easily removed from the surface of the water. Oil Solutions Absorbent is a white powdery substance that once sifted over a spill, rapidly absorbs the hydrocarbon in minutes as plasticization of the elastomer occurs. Hydrocarbons and other non-polar contaminants become microencapsulated on a molecular level in a non-leachable, non-reactive, copolymer matrix. Marvel Mystery Oil is a registered trademark of TurtleWax®, Inc.
“I followed your instructions and applied Step 1, OIL SOLUTIONS Step 1 solution throughout the area with a thin liquid film. I used a brush and scrubbed the solution on the surface. As you indicated, some bubbles appeared and the odor disappeared. I actually waited around 10 minutes before I applied Step 2, OIL SOLUTIONS Step 2, and again applied a thin liquid film and scrubbed it onto the area using the brush. Silica formed. I cleaned up the area. I waited a day and went through the process again. At completion, I would say your product performed well with two applications. Question–I work for the Federal Government. Have you listed your product with the GSA schedule? I would think that there would be a demand for this throughout the government for hazmat type of cleanup. Thanks for the product – it has helped me to resolve my problem/challenge.” Ted B., Maryland. A large truck accidentally released 30+ gallons of hydraulic oil for approximately 125 yards. The roadway was slick and unsafe for use. OIL SOLUTIONS Step 1/Step 2 additives were applied to the spill areas taking about twenty minutes for the application. By the time the length of the spill was sprayed, the OIL SOLUTIONS technology had encapsulated the hydraulic oil and was dry where the application began.The resultant reside was swept with a Bobcat sweeper, resulting in approximately one-half of one 55 gallon barrel of waste. The environmental contractor estimated that 30 to 40 bags (40 lb bags) of clay absorbent would have normally been used resulting in seven to eight barrels of waste. 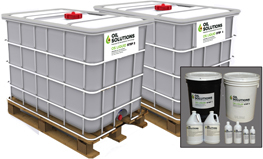 The OIL SOLUTIONS Step 1/Step 2 additives remediated/encapsulated the hydraulic oil eliminating the street safety hazard and leaving no hydrocarbon odor. A tractor trailer truck with a damaged saddle tank spilled 75+ gallons of diesel on frontage road of I-35 in Oklahoma City. OIL SOLUTIONS Step 1/Step 2 additives were applied to the spill areas including a 2 foot wide by 100 yard long strip of roadway where diesel had soaked into the asphalt. Once the OIL SOLUTIONS Step 1 was applied, the residual diesel odor was eliminated. OIL SOLUTIONS returned to the spill scene two days after application of the OIL SOLUTIONS Step 1/Step 2 additives. A light rainfall had occurred that morning. There were no diesel sheens observed on standing rainwater in the gutter. The spill site was free from any diesel odor. A slight white silica residue was still evident on the street. One week after application, another visit was made to the site. Again no diesel odor or sheens were found. The street appearance was returned to normal although it was somewhat cleaner than the adjacent, untreated asphalt. Soil contaminated with 1590 ppm crude oil and 115 ppm lead was reduced to 154 ppm TPH and less than 0.10 ppm lead with one treatment. The OIL SOLUTIONS Step 1/Step 2 products were sprayed and tilled. Tilling provides effective mixing to assure contact with the contaminant for microencapsulation. A petroleum product marketer’s warehouse packaging area (8×12 ft) was contaminated with standing puddles of motor oil, transmission fluid, and hydraulic fluids creating a safety hazard as shown in Figure A1. The estimated volume of hydrocarbon was between 0.5 to 1.0 gallon of oil. One gal of OIL SOLUTIONS Step 1 was poured over the area and brushed with a floor broom to emulsify the oil. One gal of OIL SOLUTIONS Step 2 additive was poured on the area with mixing. Micro encapsulation occurred immediately. The solid material was transferred to a container. A paper towel blot test indicated total remediation and encapsulation of the oil, because there was no free oil remaining to stain the towel. Micro encapsulation was confirmed with the laboratory analysis of the TCLP extract for TPH was non-detectable. The surface dried leaving a small amount of powdery residue. The safety issues were resolved and no oil sheens remained or were observed. After pressure washing, the surface dried to a very clean condition as shown in Figure A2. OIL SOLUTIONS clients returning from a site visit came upon a stranded car with an engine fire. Application of the OIL SOLUTIONS product, using a common household garden sprayer immediately extinguished the fire and encapsulated the leaking fuel. A crude oil tank overflowed into a diked area onto three inches of gravel on clay. A 6×10 ft demonstration area was cleaned using one gallon each of OIL SOLUTIONS Step 1 and OIL SOLUTIONS Step 2 for a total chemical cost of less than $40.00. The gravel was cleaned by alternatively spraying the OIL SOLUTIONS additives, diluted 50%, on the gravel and raking. A total of five spraying and raking sequences returned the gravel to the light-brown condition. A crude oil tank overflowed onto a grassy area and a water retention area. The client was required to clean up the spill by the Texas Railroad Commission or face fines. Utilizing the OIL SOLUTIONS Step 1/Step 2 products, the entire site was completely remediated. A sample of 10W-30 motor oil was micro encapsulated with the OIL SOLUTIONS Step 1 and Step 2 additives and allowed to dry. A TCLP extraction followed by analysis for TPH indicated less than 1 ppm (parts per million) extractable TPH in the micro encapsulated sample. A similar test with standard Type F hydraulic oil resulted in less than 7 ppm leachable TPH.